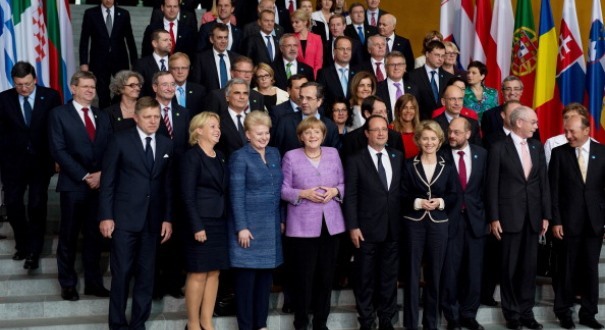 Camoron and Obummer plus these pathetic lot above represent The West's governing class. If I had a say it would be a remedial class for backward delinquents. Children hell bent on stirring trouble and mayhem, then running away. Why so unrealistcally nasty to Russia? Putin has behaved with a maturity our crowd are palpably bereft of. In the face of an unsubstantiated set of doctored propaganda and faux and pathetic outrage at Russia's support of the barbaric rebels in Ukraine, the reality unfolding is showing Vlad's fitness for High Office and The West's opposite and nasty unsuitability. In just four days the Ukrainian, Russian leaning peoples, have got most of the victims repatriated in refrigerated trains, located the black boxes, allowed extensive access to European observers and made safe the area, despite attacks and efforts by Kiev to destabilise their opponents standing and reputation. Whilst Camoron was shouting and stamping his feet, along with the rest of our gullible, spoilt brats, the authorities and by association, Russia, were getting on with essential work. Just today the local people held a memorial vigil, at part of the site, for the victims. Where in all the more reliable footage and evidence is the ranting against Putin and screaming for noses to be cut off to spite their own economies justified? What childish petulance backed by not a shred of common sense decency. This same gung ho "look at me" infantile behaviour, so beloved of Bliar and now his equally pathetic legacy hunter, "Call me Dave", has been called out by this terrible tragedy. What is frightening is this juvenile would destroy our already fragile economy. He would play "Russian" roulette with a nuclear power and threaten any hope of some kind of stability in the world. Why? Just as he has colluded with Labour to overwhelm our Nation, so he seems happy to chastise Putin for wanting to protect his own people. If, as looks ever more likely, MH17 is at the hands of the thugs from Kiev, friends and gangster allies of the West, then what? More apologies from Sky insensitive cohorts, groveling at their own unpleasantness. Don't hold your breath.